As I comb through my bead stash taking inventory – 5 trays down and 13 to go – I am a little overwhelmed by how many accents beads I currently have in my stash. Although I’ve gotten out of the habit of picking up beads that I know I’m not going to use readily, I still have a pretty good collection of beads that I love, all waiting to get used up. All of these accent choices have inspired me to look at them a little differently. For this month’s color trios, I decided to skip the seed bead portions of the palettes, and go with three coordinated accent beads. Spring colors and lively shades seemed to jump out the most, so I decided to back them all up with simple black seed beads to make the palettes a little more contemporary and versatile. First up I chose delicious wasabi green nautilus glass coins, medium blue drops, and turquoise Picasso teardrops. I love the way the two blues soothe the electric green, adding a little depth and blending everything together just right. There’s definitely an aquatic vibe happening with these three accents, and not just because of the shell motifs. This palette is like a breezy day at the beach a month before swimming weather arrives. Next I grabbed some polka dot Indonesian glass rondelles with their bright primary colors and pretty gray backdrop. To these I added intense teal blue Java glass teardrops and sour green Czech glass pinch beads. Although some of the colors ended up similar to the first palette, there’s a much different feel to this trio – more like a ladybug’s picnic. I simply had to begin the final palette with yellow Picasso rondelles, which look amazing with the black seed beads. I wanted something a little sweeter this time around, so I added sugary blue fiber optic tubes and some pink-lined peanut seed beads. I like the primary color/rainbow sherbet thing that’s going on here, although I wish the peanuts were more of a magenta than pink. Do you ever like to mix multiple accent beads in your designs? What’s your favorite way to use them? I think that this new blue bugle cuff might be the reaching the record for the longest I’ve ever worked on a piece, not counting the Cornucopia lariat, which I took a few months off from way back when. For the past couple of weeks I’ve been laying low with a ridiculous cold, and as a rule I never bead when I’m feeling ill. I’ve also been working through my illness at the day job, which left me with very little energy left for anything creative. Luckily, things are getting back to normal, and I’m almost ready to add the trim on this pesky cuff and move on to something new. I’m still debating whether I should work on an all-seed bead collar that I’ve been craving, or make use of some of my many untouched accent beads. It will be nice to get back to working again! Now I just have to find the motivation to finally do inventory and taxes, so I can just focus on beading. 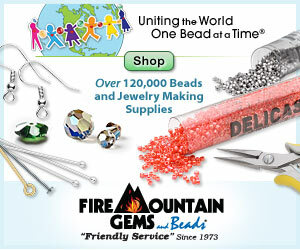 Like the basic and versatile seed bead, jewelry and craft wire is a simple material with endless uses in jewelry design. With just a few essential tools, anyone can turn an ordinary length of wire into gorgeous and unique components for finished jewelry. The core techniques are simple and easily interchangeable, so once you’ve learned a few key elements, you’ll be on your way to a vast treasure trove of designs. 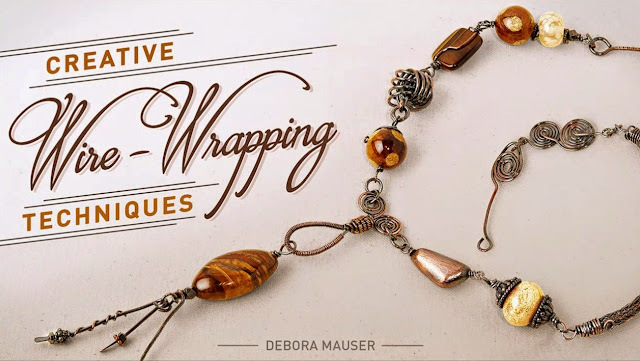 In her new Craftsy class, Creative Wire-Wrapping Techniques, jewelry designer Debora Mauser guides viewers through seven informative lessons. Each lesson builds on skills learned in previous ones, and combines new techniques to create some stunning pieces. Starting with basic components like handmade earwires, headpins, and - my personal favorite - paddled wire, Debora shows beaders how to work safely with wire and create professionally finished pieces. Then it’s on to more complex pieces that can be used to make handmade chain, pendants, beads, and earrings. Later lessons also cover coiling, riveting, adding patina and so much more. New and experienced beaders alike will marvel at the extensive repertoire offered in the class. You'll learn about using different types of pliers, hammering, working with torches, and getting great results with tumblers. What I like most about the lessons is that Debora encourages viewers to try their own variations and offers design tips for transforming the techniques learned into new styles with simple tweaks. She also offers plenty of trouble-shooting tips and ideas for getting the best results from your tools and materials. Like all Crafty classes, you can review lessons as often as you like, replay steps with a single click, and ask questions or share your creations. 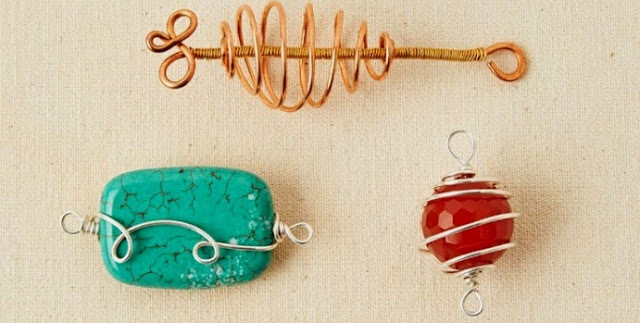 If you’re looking to add some new handmade components to your jewelry designs, or want to practice some fabulous wire-work techniques, the Creative Wire-Wrapping class will not disappoint! You can see a class overview and learn more at Craftsy.com. Want to give it a try? Leave a comment on this post letting us know what you'll make with your favorite wire-wrapping techniques, and you’ll be entered for a chance to win the complete class! Be sure to include a contact method with your comment if you do not have a profile with email enabled. One winner will be drawn on Saturday, March 28th. I would like to thank Debora Mauser and Craftsy.com for giving me the opportunity to preview this class. Inspirational Beading has not received compensation for featuring products or content in this post. A week away from my bead space feels like a year, and so this month I’m definitely on the lookout for new inspirations. I have always found that one of the best places to look is right in my own bead stash, where there’s always something waiting to be turned into a rewarding design. Often there are beads that I’ve forgotten all about, and seeing them in a new light can be all it takes to get ideas and motivation rolling. One of my favorite things in the bead cupboard right now is a strand of faceted Czech glass rondelles in a stunning yellow. I’ve always loved these beads with the Picasso finish, particularly how they look in earring designs. Since I’ve always sort of pictured them that way, I never got around to grabbing any for myself, until just recently. I’m still not sure how I’m going to use them – probably to add some pizazz to a collar or lariat – but just the idea of having them there is enough to get some fledgling ideas sparking. Also loitering in my stash is a handful of Czech glass spike beads in an awesome shade of orange. I didn’t really have a plan in mind for these when I ordered them – I really just wanted to see them in person. I love the shape and the possibility of them. I’m thinking they might work well with a herringbone concoction, or as collar accents – it all depends on how spiky I want them to be, I suppose. Last but not least, I treated myself to a very long strand of multicolored mother of pearl chips on a whim. I love the palette – it looks like the world’s most tropical fruit salad – but I probably won’t use all of the colors in a single piece. I think I can get a lot more out of them by separating the colors and creating individual palettes for them. The blue and yellow are my particular favorites. This week my workspace is feeling totally neglected. I caught one of those early spring colds that feels as if you’re being sucked back into the depths of winter, and it put me into a huge creative slump. Luckily, I have made a bit of progress on the new bugle cuff, but things are slow going. It has been nice to get in a lot more relaxation time than I’m used to, though. Hopefully, I’ll figure out where my motivation is hiding and get back to my normal routine soon. I decided to swap out the beige seed beads I had originally chosen for this piece, and use cream instead. The beige looked a bit too yellow, and seemed to clash with the blue. I still haven’t decided how I’m going to work the trim. I’d like to include both black and cream, but I might just go with a single color. I won’t know for sure until I try them both.